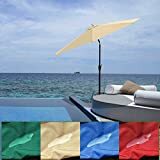 We all like enjoying the sun with family and friends, while remain cooler by using this great patio sun shading parasol. 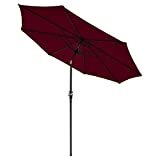 This 8-rib constructed parasol provides you plenty of stability for the 2.7 Meters of shades. The tilt function can make you adjust the canopy to any angles you want to resist the harmful UV in all directions! Yes, the PA coated polyester cover can protect you against UV. It’s probably the best way to stay outside in any weather, such as large sunny day, little rainy day and windy day. The 180G waterproof canopy and strong aluminum frame can provide you an easy and comfortable environment. NOTE: IN ORDER TO EXTEND THE SERVICE TIME, PLEASE DO NOT USE IN BAD HEAVY RAINY OR STRONG WINDY DAY! Shipping terms: Ship to UK Mainland ONLY. We do not ship to: AB31 to AB38, AB40 to AB56, IV1 to IV28, IV30 to IV32, IV36, IV40, IV52 to IV54, IV63, KW1 to KW14, PA21 TO PA28, PH4 to PH41, PH49, PH50, BT (Northern Ireland) HS, IV41 to IV49, IV51, IV55, IV56, KA27, KA28, KW15 to KW17, PA20, PA41 to PA49, PA60 to PA78, PH42 to PH44, ZE, IM (Isle of Man), GY & JE (Channel Islands). If you really need the item in these regions, please contact us before you buy it.